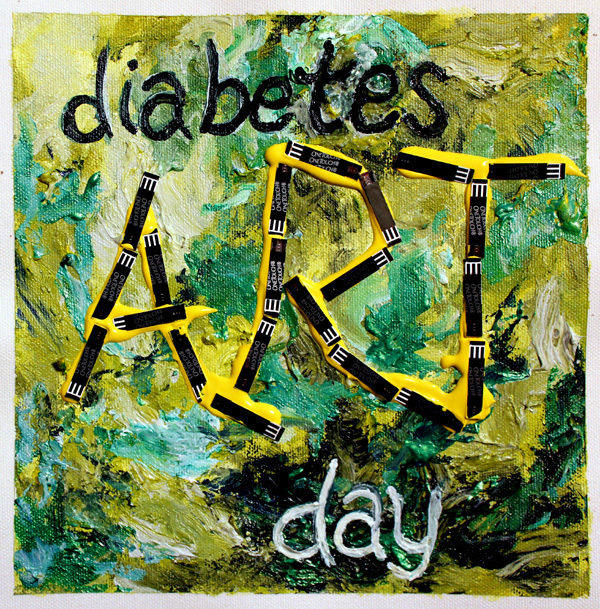 My friend, Lee Ann Thill, who blogs at The Butter Compartment, started Diabetes Art Day a couple of years ago. She is an Art Therapist in the Philadelphia area and she started this day to encourage those of us touched by diabetes to express ourselves and tell our story through art. Last year, I used a photo of some of our local diabetes crew, painted a blue circle around us to represent the WDD blue circle as well as, to me, represent the unity of our group. I then put all sorts of calculations around that to represent all the math required, when you have diabetes. The thought is that it was the best (my friendships) and the worst (having to do math all day long!) of diabetes. . .yet this is the story for people with diabetes around the world. This year, I’ve got a mixed media piece in mind. I’ve actually thought about it for months and sort of planned out how I’d like it to look. What’s great about this day, is that it’s allowed me to think about my diabetes story and boil it down to a few images which make some of the confusion, anger and fear manageable to think about. Does that make sense? I hope so. So, I’m writing about it today to make sure you’re all aware of it, that you have time to plan a project of your own and that you’ll post it on the Diabetes Art Day website. JOIN THE FUN! TELL US YOUR STORY! September 24th is the magical day. Thank you Lee Ann for starting Diabetes Art Day and giving us the opportunity to express our stories through art. You have inspired us in so many ways. . .so artfully. I can’t wait to see what you have in mind!